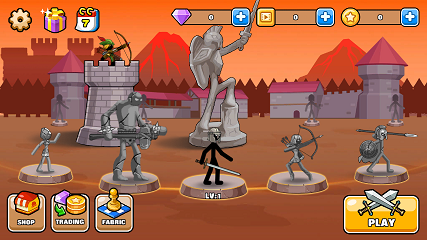 In This Game, You Fight Against Stick Man Type Characters With Your Troops. You Only Have One Bow At The Start Of The Game And 100 Points. Use These Points To Summon Troops. You Have Two Goals While Playing Game – Slay Down Enemies And Summon Your Troops. Slay Down – First Thing You Have To Do In This Game Is Go Ahead And Slay Down Enemies. You Will Get Energy/Points By Killing Enemies. You Just Tap On The Screen Release Bow. Points/Energy And Summon – You Can Not Defeat All Enemies Alone. So You Summon Your Troops By Utilizing Collected Energy Points. They Will Help You In Fight. The More You Kill Enemies The More You Will Get Points/Energy. Utilize These Points To Call Troops. Troops – Initially, Only 1 Troop Is Unlocked Out Of 17. 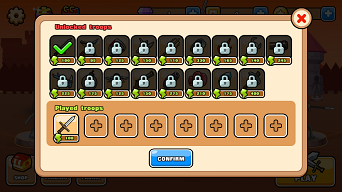 Each Troop Has Some Special Ability/Skill/Weapon Like Sword, Bomb Etc. How To Unlock Troops – You Can Unlock Troops In I AM Archer Game With Coins Or Diamonds. To Collect Coins You Need To Clear Chapters. Diamonds – You Can Exchange Your 10 Diamonds For Over 1500 Coins. Simply Sign In To Game – Claim Your Daily Reward To Collect Diamonds. Upgrade Character – Upgrading Character In This Game Is An Important Part. You Need To Constantly Upgrade Your Characters/Troops[Need Coins Or Watch An Ad]. Modes – I Am Archer Game Comes With Two Modes – Stage And Endless. Process Of Playing Game Is Same But Difficulty Level In Endless Mode Is High In Comparison To Stage Mode. Overall It Is A Great Fun Game With High Difficulty. It Is Offline[But To Load Internet Is Required] Game. Size – 40 MB/Varies[Approx.]. Price – Free[Contains Ads, In-App Purchase]. Download – Here[Google Play Store].